If you minister at a church that embraces contemporary style worship music, somewhere along the way you have struggled with how to control the sound volume from loud guitar amps. We’ve worked for years to deliver great drum sounds that aren’t so loud that they drive valued members of our congregation out the door, seeking a church that just isn’t that loud. Do you have any idea how many church members you have lost due to sheer sound volume during the worship set? Probably no one in your church leadership has any idea, although I would venture to say that they would be disheartened if there was a way to figure that out. There might be a few complaints on the way, but one day a family just stops showing up, and no one knows why. First off, you have to know that I’m not on a personal quest to control the sound volume of every player. I have a degree in music, and made my living for a number of years playing in rock bands. A Hammond organ and a pair of Leslies cranked to 11, plus a synthesizer and Rhodes to fill out the sounds. I’ve been on both sides of the mic, and love great, loud sounds. A drummer needs to hit the drumhead hard (loud) enough to get the kind of sound they’re looking for. Likewise, a guitarist needs to crank their amp up loud enough to get the tone they’re looking for on certain songs. But there is a reality that in many, many churches we simply have to get control over the sound level or face losing church members. We’ve been working for a few years to achieve some measure of control over the drum sounds, to varying degrees of success. Acoustic drums gave way to electronic drums, but the sounds were cheesy, so we went back to acoustic drums, which were still too loud so we started putting them behind clear plastic shields, which were fine unless they were placed close to a choir, so we completely enclosed the drummer. It looks funny on some platforms, but if we want great drums, and the drummer wants to plan an acoustic kit and hit it hard, it many cases complete enclosure is the best solution. So why not enclose the guitar amp as well? Watch a guitarist set up their amp on stage, and notice where they stand when they play. They know where the sweet spot is to listen to that amp, and that’s where they want to stand. But all too often that guitar amp ends up pointing right at some seating section, blasting out the congregation sitting there. We did just that on a recent project, and I thought you might like to read about what we did. We simply had the carpenters build us a large wood cabinet with four compartments. The internal measurements of each compartment are 48”W x 36”D x 36”H. (Big enough for your guitar amp.) The intent is to be able to place the guitar speaker cabinet for each of four different guitarists in those compartments. We then mic the guitar speaker cabinet, and feed the output of that mic back to the FOH mixing console. In some cases, the amp head and the speaker cabinet are separate units, so the guitar amp head can stay on stage with the guitarist, and only the speaker cabinet is placed backstage. You’ll simply run a speaker cable from the amp head back to the speaker cabinet in the compartment. We place a mic inside the compartment to pick up the sound from the guitar speakers. In other cases, the speaker cabinet and guitar amp are built into one unit, so the entire unit has to be placed inside the compartment. That places the guitar itself unusually far from the amp, maybe forty to sixty feet away. That’s a bit of a stretch for a high impedance guitar cable. So we need to specify in effect a transmit/receive direct box pair. Radial Engineering has a unit called the Studio Guitar Interface (SGI) that fulfills this need very well. The “transmit” unit sits on stage near the player, receiving the signal from their guitar (or from their pedal board), while the “receive” unit sits at the guitar amp head, feeding that guitar signal into the input on the guitar amp. If the guitar amp head is placed inside the compartment, then of course you’ll want a fan (like a 4-inch muffin fan) built into the side of the compartment to exhaust the heat. That fan needs to operate as quietly as possible or else the fan noise will be picked up by the microphone. You will also need a connector to plug in a microphone, which of course carries the signal back to the FOH desk. Construction of each compartment has to be very solid. Think about it – how loud is each guitar speaker cabinet going to be inside those compartments? Quite loud. Maybe we don’t need to achieve 100% separation, but we certainly want to be able to turn up one guitar sound in the main mix without significantly hearing any of the others. It’s also possible for the vibration of the guitar speakers to transfer that sound energy to the other compartments, and then get picked up by the microphones in those other compartments. So do plan for isolation as best you can. Consider building all four walls with 3/4-inch plywood or MDF. Brace them internally to dampen vibrations of each wall. Pay special attention to the floor of the top units, which is the ceiling of the unit below. Line the walls with some acoustic material like 2-inch thick Sonex or similar product, or fabric-wrapped compressed Fiberglas or Rockwool panels. At a bare minimum, carpet glued to the walls will help, but only marginally. You really want the thicker sound absorbing materials. And since you may be putting a heat-generating device like a guitar amp head in there, plan to use fire-rated materials throughout. That’s one reason why fabric-wrapped Rockwool panels would be a smart choice. To improve things further, instead of building these guitar isolation cabinets as one unit, you could build four totally separate, individual cabinets (one for each guitarist to use), and place them side by side rather than stacking them. Or you could stack them individually, using machine rubber or some other isolators to minimize transfer of those vibrations. 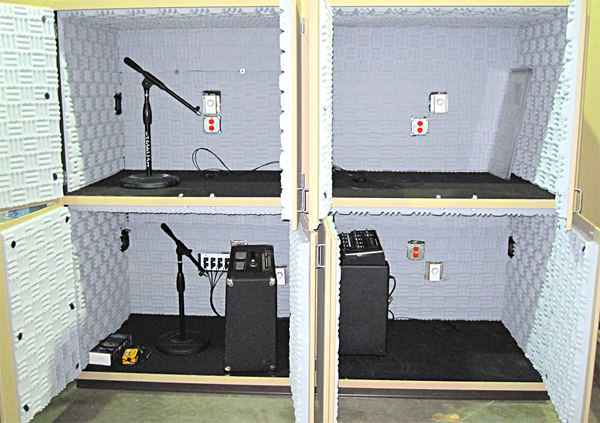 There are various creative ways to achieve this goal of sound isolation of the guitar amps. I’ve included some illustrations here to help you further visualize the concept. Properly constructed, such units can truly help you achieve the sound control you need without sacrificing the sounds that your guitarist wants to use. Copyright Taipale Media Systems, Inc. Published in Volume 3, Issue 2 of the Technologies for Worship Audio eNewsletter. Used with permission.